Depreciation really is a beautiful thing, for enthusiasts anyways. A quick search through your favorite car classifieds reveals Porsche 997’s selling for nearly half of their original purchase price less than 10 years after they rolled out of the factory in Stuttgart. While a 997 Carrera might’ve been a bit out of reach at $100,000, they’re mighty appealing at $50,000 offering damn near the same levels of luxury and performance of the 991’s at half the cost. Now if you were wise enough to have gotten yourself into one of these extremely competent machines, you’re probably wanting to get the most out of your purchase, thus landing you here. In this edition of Best Mods I’m going to be walking you through some of the best mods for Porsche 997 Carrera & GT3 to reach whatever goal you have for your P-Car. 9 times out of 10, the fastest way to completely transform the look of a car is by upgrading the wheels. Your 997 is no exception. To be frank the standard 997 Carrera wheels are some of the ugliest Porsche has ever designed. They’re at very best too small for the body of the 911, at worst they’re chunky and uninspiring to look at. There’s not a single characteristic to boast about for the factory wheels shown above, something that absolutely should not be the case on an otherwise beautifully and timelessly designed car. So let’s get right into it and look at some options that are more befitting of your 997. First up, one of our all time favorite wheels, the Forgestar F14. Custom built per order, each set of wheels is manufactured to perfect specifications by the wheel fitment experts at Forgestar, guaranteeing perfect fitment. F14’s come in several concavity profiles, semi-deep concave, deep concave, and super deep concave, allowing for different levels of aggressiveness depending on the theme of your car. Another offering from Forgestar is the CF10. 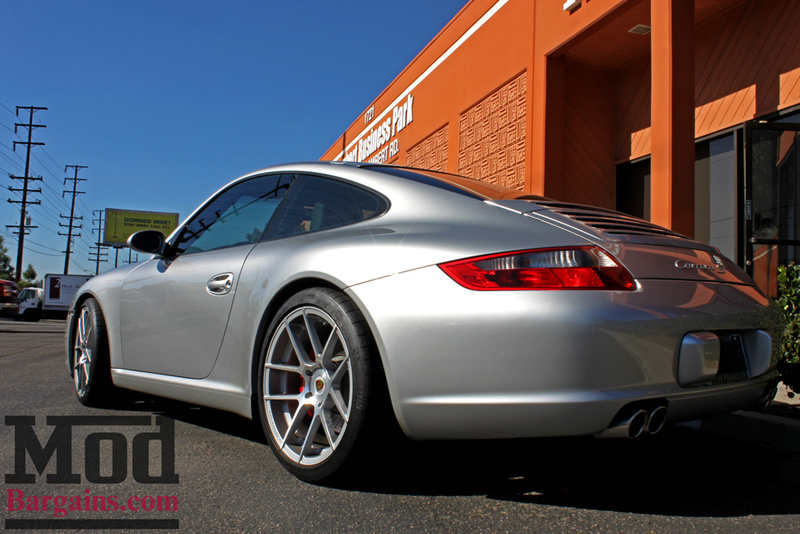 With a simple 10 spoke motorsports inspired design, it fits the 997’s clean lines beautifully. Available in a multitude of standard colors and an unlimited selection of custom colors (for a premium of course) Forgestars can be built to give your car a completely new look. For example, take a look at this 997.2 Carrera on Forgestar CF10‘s, finished in Gloss Red. As you can see, between the gloss gunmetal and the gloss red, the look of the car is completely different. From sleek and subtle to smack-you-in-the-face attention grabbing, any theme can be achieved. Forgestars are manufactured using flow form technology to provide an incredibly strong wheel without the high costs associated with a fully forged wheel. The value of Forgestar is found in the fact that set of 4 Forgestar wheels can be had for less than a single forged wheel from other manufacturers. At ModBargains, we believe in Forgestar so much that 7 of our just over 20 employees have put Forgestar wheels on their personal vehicles, including myself. Another well respected wheel manufacturer is Avant Garde. Avant Garde has 3 wheels that are by and large their most popular models for Porsches: Ruger Mesh, Ruger Split, and Ruger 5. We’ll start off with the Ruger Mesh. This classic full face mesh design looks good on just about any make or model, and the 997 is no exception. Available in Matte Black and Hyper Silver, you really can’t go wrong. Hyper Silver is a great choice if you’re going for a subtle ‘OEM plus’ look. The next offering from Avant Garde is the Ruger Split, a modern split 5 spoke design. This elegant design looks right at home on the 997. Available in Satin Silver, Dolphin Grey, & Matte Black, this wheel can give your 997 a variety of looks, whether you’re going for something aggressive or classy. The final option from Avant Garde is the Ruger 5. The Ruger 5 is a more angular approach to the classic 5 spoke wheel. Although the Ruger 5 only has two standard finishes, Satin Silver & Matte Black, Avant Garde has a wide variety of custom finishes available for an extra charge. HRE Wheels is traditionally known for making some of the highest quality forged wheels on the market. However, as we discussed with Forgestar, true forged wheels are exponentially more expensive to produce than any other form of manufacturing with nowhere near exponentially higher strength. HRE understands that not everyone can afford to spring for a $6-8,000 set of wheels, and as a result they’ve introduced their Flow Form line. The HRE FF01 & FF15 are wheels of exceptional quality with a pricetag that’s roughly a quarter of their fully forged cousins. One of our most popular wheels is the HRE FF01, a full face mesh design that looks good on pretty much everything. Standard available finishes are Tarmac Black and Liquid Silver with a plethora of other custom finishes available which are applied in house at HRE headquarters in Vista, California to ensure the finish is up to HRE’s high standards. One of the more popular custom finishes is IPA, a rich bronze finish with just enough character to stand out, but not enough to be overkill on a vehicle as sophisticated as your Porsche 997. HRE’s second Flow Form model is the FF15. Featuring a 15 spoke full face design, they’re another great option for your 997. The FF15’s on the 997 below are wearing the Redline finish beautifully, serving as accent pieces for the whole car. Now that we’ve sorted out the wheels, lets work our way upwards to the suspension. There’s nothing worse than a great looking set of wheels paired with some awful wheel gap. Your Porsche is a purebred sports car, not a trophy truck, so what’s with that ride height? Aside from the greatly improved aesthetics, lowering your car on a set of lowering springs or coilovers is one of the best ways to improve your 997’s handling. There are a multitude of options available for your Porsche, so lets take a look. The most affordable means of lowering your car is with lowering springs. There are several companies manufacturing springs for your 997, all of which provide a similar amount of drop. The advantage of using lowering springs compared to a full coilover is the price; lowering springs will run you between $300-$400 whereas coilover systems start a little over $1,000 and go up from there. The downside of lowering springs is the complete lack of adjustability as well as the fact that they may not be appropriate for your vehicle, depending on the mileage. Because lowering springs are actually shorter than the factory equipped springs, your struts will always be somewhat compressed. This is fine for cars with lower mileage, but if you’re nearing that 70,000 mile mark, a coilover system might be a better option for you and your car. Now that we’ve covered the pros and cons of lowering springs, lets look at what’s available. There are 3 manufacturers of springs for your 997: Eibach, Vogtland, & H&R. Each of these lowering springs provide between .8″ and 1.2″ of drop in both the front and rear, however the AWD models (Carrera 4 & 4S) receive a slightly less aggressive drop compared to their RWD counterparts. To give you an idea of the amount of drop to expect from lowering springs on a 997, check out this 997 Carrera dropped on Eibach Pro Kit Lowering Springs with Avant Garde Ruger Split wheels. As you can clearly see, this 997 Carrera has a much more aggressive stance after installing the Eibach Pro Kit Lowering Springs which lowers the car by 1.2″ front and rear. You can expect similar changes in ride height between the different manufacturers with the only differences being ride stiffness and price. Now if you want to go even lower than what you’ve seen above, the only way to go is either a full coilover system or air suspension. We’ll start with coilovers as that’s the more common route. If you want to go low on a budget while reaping the benefits of an adjustable coilover, BC Racing’s BR Series Coilover is the best way to go. Coming in at just $1,245 for a 30-way adjustable coilover system, it’s hard to find a better value. The BR Series coilover line also features their “extreme low” option for that extra low showcar stance. Look how perfectly these 997’s sit after having their BC Racing BR Series Coilovers installed. While BC Racing’s coilovers are a great value, you do get what you pay for. The BR Series of coilovers has a single adjustment knob for both the rebound and compression, not ideal for dialing in your suspension for track or autocross duty. On the other hand, KW Suspension’s Variant 3 coilovers are world renowned as one of the best coilover systems on the market and offers independent adjustment for dampening, rebound, and compression, allowing for a fully tailored suspension system for whatever environment the car will see. If you’re looking for the ultimate track focused yet streetable coilover, the Ohlins Road & Track Coilover system is for you. With over 200 world titles to Ohlins’ name, no other suspension manufacturer has a stronger racing pedigree. Ohlins is also known for their incredible build quality. Just by looking at these coilovers, you can tell these are quality pieces. While coilovers offer plenty of adjustability, it’s impossible to beat the versatility of an air suspension setup. If you want the option to completely slam your 997 to the ground for full showcar effect and then raise it up for steep driveways and horrendous city streets, an air suspension system like the AirRex Air Struts is your move. Air suspension technology has advanced tremendously in the past decade, bringing their performance level up to par with many coilover systems. Last up for perfecting your suspension setup are sway bars from Eibach, GMG Racing, and H&R. Sway bars reduce body roll, improving turn in and responsiveness. While the GMG Racing sway bar is the most expensive, it is also the only option of the 3 that is adjustable, allowing you to dial in exactly the right amount of roll. Too little body roll can make handling unpredictable, while too much body roll makes for sloppy handling characteristics; getting the right balance is essential. Stiffer sway bars are also a great means of tightening up handling while using a softer spring and strut for flat cornering with a more supple ride around town. What you hopefully just listened to is the Velocity AP Inconel Race exhaust for 997 GT3, and if that sound doesn’t make the hair on the back of your neck stand up, then I don’t know what will. While a certain amount of that eargasm can be attributed to the GT3 badge on the back of the car, your Carrera is still capable of so much more than your stock exhaust is giving you currently. So let’s look at, and more importantly listen to some of the exhausts that are out there. We’ll start with the Carrera then move on to the GT3. One of our favorite exhaust manufacturers is Remus. As an OEM supplier for factory exhausts, Remus knows how to make a quality, long lasting, perfectly fitting exhaust system. For the most part, Remus exhausts tend to have a tamer exhaust note, making them perfect for a more subtle daily driver. Remus’ system is available in two configurations, the full engine back system (pictured above) or just the replacement side mufflers with tips for a less aggressive note. Going in order of aggressiveness, next up is the AWE Tuning exhaust for 997 Carrera/4/4S/Targa. The AWE system lets the flat 6 scream at high RPM’s, while civil at low RPM’s for daily driving. AWE actually got started in the automotive industry working on air & water cooled Volkswagens, leading to the name “Air & Water Enterprises” which was later shortened to AWE Tuning. AWE started developing their lineup of products for Porsche’s in 2001 and has solidified their position as one of the leading manufacturers of aftermarket parts for Porsche, Audi, VW, Mercedes, & BMW over the past 15 years. Not only does this system sound great, it also makes great power, gains of 28-39hp & 28-31 tq for 997 Carrera S! Another option for your 997 Carrera comes from Velocity AP in the form of their Kline Innovations Exhaust for Porsche 997 Carrera. Velocity AP wanted to create an exhaust system with limited drone while retaining the higher RPM scream from the flat 6, and they’ve succeeded. They boast a 25 year warranty for their workmanship for their exhausts, confident that you’ll be satisfied with their product for literally decades to come. If you’re looking for that Porsche motorsport sound from your 997, look no further than the Fabspeed Muffler Bypass pipes. These muffler bypass pipes do exactly what you’d think, they bypass the entire muffler section on both sides of the cars and routing exhaust to the factory tip locations. If you want a complete engine-back setup for your Carrera, pick up the Fabspeed Sport Headers for 997 Carrera and the Fabspeed Cat Bypass X-Pipe for 997 Carrera for maximum power gains. Combined with the Muffler Bypass pipes, this will be a complete “straight pipe”, which if you’re not familiar with exhaust system design means this will be VERY LOUD with lots of near pornographic popping, snarling, and crackling from your exhaust. If you’re looking for most of the power gains from the aforementioned combination without the extreme volume levels, take a look at the Fabspeed Performance Exhaust for 997 Carrera, paired with the Fabspeed Sport Cat X-Pipe for a refined, daily drivable exhaust note that still makes you feel like you’re flying down the straight at LeMans in a GT3 Cup car. If you’re one of the oh-so-lucky few with a 997 GT3, we have some fantastic exhausts for you. From the factory, the GT3’s exhaust note doesn’t match up with the racecar-esque aerodynamics or the spleen destroying handling. Thankfully the mad scientists at AWE Tuning, Fabspeed, & Velocity AP felt the same way, leading to the creation of their own systems. AWE Tuning’s exhaust for Porsche 997 GT3/RS is a beautifully simple system incorporating their own equal length headers, 200 cell HJS high flow catalytic converters, and straight through mufflers. Not only does it sound fantastic, it’s also good for gains of 11hp & 20tq. Fabspeed has a similar offering when combining their Fabspeed Catted/Catless headers, Fabspeed Side-Muffler Bypass pipes, and Fabspeed MaxFlo exhaust for Porsche 997 GT3/RS. The complete system is good for 29hp & 20 ft-lbs of torque, so your GT3 will both sound and feel like a GT3 Cup car. The last and most exotic exhaust system for your GT3/RS comes from Velocity AP, which you heard at the beginning of this section. This is a complete replacement system as well, featuring headers, high flow cats, x-pipe, and high flow mufflers with valves that enable two distinctly different exhaust notes in quiet mode or sport mode. In sport mode, the mufflers are completely bypassed letting you hear everything your GT3 has to say. This system is available in 2 materials, standard stainless steel and Inconel, an ultra lightweight alloy normally reserved for Formula 1 cars and high temperature military applications. This system is also good for gains of 30hp & 30tq when paired with Velocity AP’s ECU remap to take advantage of the decrease in back pressure. After freeing up all of that back pressure with your new exhaust, it’s time to free up the restriction on the other side. Your engine is one big pump, sucking in air through the intake and pushing it out through the exhaust and the more efficiently it can do that the more rotational force it can generate. If we think about it at an elementary level, the output of a pump is limited by whichever side has the more restrictive piping. If you have more exhaust flow than intake flow, you aren’t taking advantage of the drop in restriction, leaving power on the table. With that fundamental understanding of the importance of a balance intake/exhaust combination, let’s look at some intakes. The Fabspeed MaxFlo cold air intake is one of the best mods for Porsche 997 Carrera. Constructed out of beautiful lightweight carbon fiber, this intake sounds mean and performs, with gains of 19whp & 21wtq. As we follow the point of restriction up the intake tract, the next issue is the factory plenum. IPD has a redesigned, high flow plenum available to replace the standard T-shaped plenum. The IPD Competition Intake Plenum has a y-pipe design that’s ideal for air flow and a larger 82mm inlet that works in conjunction with the factory throttle body from the 997 GT3 to free up maximum gains of 23whp & 21wtq at 6000rpm with peak gains of 15whp & 12wtq. Note that to use this plenum, purchasing the 997 GT3 throttle body is necessary. If you don’t want to make the plunge on both the plenum and GT3 throttle body, there are also IPD’s plenums for 997.1 & 997.2 Carreras that require no additional hardware. If you have a GT3, this intake from K&N is one of the most cost effective means of picking up big power numbers. Not only will this intake net you an additional 24hp & 19tq, it’ll also sound fantastic with a deeper induction and exhaust note for the full sensory experience. Now that you have all of the supporting modifications taken care of, we can retune your engine’s ECU to take maximum advantage of the additional air flow. For your 997 Carrera we recommend the Fabspeed/EVOMSIT Carrera ECU Tune, a “plug and play” performance tune with gains of 14hp & 14tq. This tune is safe for both 91 & 93 octane, is completely reversible, and will leave no traces of any modification for hassle free dealership visits as there is no modification to any OEM parts required for installation. It even retains the OEM sports button integration for a truly seamless experience. If you want to squeeze every last drop of power out of your GT3, pick up a COBB Tuning Accessport today. Not only will the AccessPort give you maximum gains of 28hp & 15tq, but it’s also packed with extremely welcome features such as valet mode which limits the rpm to 4000, antitheft mode which prohibits the car from starting without reconnecting the AccessPort unit, raised redline to 8650 rpm, and left foot braking to help settle the car mid corner without cutting power from the engine. Customers have also raved about superior drivability and shifting with more accurate throttle response. Next time you pull up to the valet stand and hand the keys to your baby off to a complete stranger, you’ll be wishing you had an AccessPort. There are two versions available, THIS is for 997.1 (2006-2008) and THIS is for 997.2 (2009-2011). Well, that about wraps up the Best Mods for Porsche 997. I hope you’ve learned something new today and better understand the true potential of your Porsche, whether it’s a Carrera or GT3. If you have any questions about the products highlighted above, don’t hesitate to give us a call at 714-582-3330 to speak with one of our Mod Experts, or send us an email at [email protected] Now, get out and drive that 911!